[Image: Humans creating a future archaeological site on the moon]. In a meeting today in Sacramento, commissioners might vote to register items left behind on the moon by Apollo astronauts "as an official State Historical Resource," the L.A. Times reports. After all, "California law allows listing historical resources beyond the state's borders—even if it's more than 238,000 miles away." 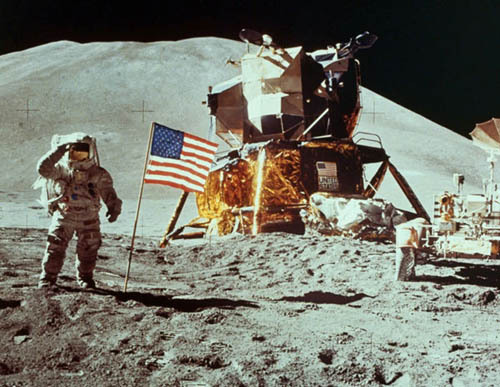 Some of the 5,000 pounds of stuff Neil Armstrong and Buzz Aldrin abandoned at Tranquility Base was purposeful: a seismic detector to record moonquakes and meteorite impacts; a laser-reflection device to make precise distance measurements between Earth and the moon; a U.S. flag and commemorative plaque. Some was unavoidable: Apollo 11's lunar module descent stage wasn't designed to be carted back home, for instance. "They were told to jettison things that weren't important," anthropologist Beth O'Leary, "a leader in the emerging field of space heritage and archaeology," tells the newspaper. "They were essentially told, 'Here's eight minutes, create an archaeology site.'"" If the Apollo site does become, incredibly, a California state landmark, this decision will open a legal path for the location to be recognized as an official UNESCO World Heritage Site. This, in turn, will help protect it from vandalism during "unmanned trips to the moon by private groups, and even someday by tourists." While the implied vision of Indiana Jones, Astronaut, is an exciting one, the idea that the State of California could someday have historical jurisdiction—or something like it—over a fragment of the moon's surface seems genuinely astonishing to me. Perhaps we could even have it declared part of Los Angeles County—the first offworld municipal exclave. Texas and New Mexico also have plans to "place the items on historic registries" later this year, we read.